Today I’m sharing 11 fabulous gift ideas that are as clutter-free as gifts get, and are items that anyone would love to receive! The gift of self-care can be such a wonderful thing to receive. Receiving massage or spa gift cards is personally up there on my list of absolute favorite gifts. The gift of relaxation and taking care of yourself during the holidays is priceless! Tickets to go see their favorite band perform, or spending a night in gut-wrenching laughter by seeing their favorite comedian can be such a fun treat to have a night out on the town. Experience gifts are great because they allow the receiver to create memories that they will cherish forever! There are so many fun resources available to adults that allow you to either brush up on old skills, or learn something entirely new. Some fun ideas include music classes to learn a new instrument or language lessons to brush up before your next big international trip. Other ideas that might be nice to gift to a couple would be dance or cooking classes that they could participate in together. Quality chocolates and candies can be a delicious treat to enjoy as a gift, especially since most people wouldn’t purchase these types of treats for themselves. Being able to light a nice candle and have the aroma drift through the room is such an easy way to make your home feel cozy and warm, especially during the chilly winter months. Treat someone to a night out on the town on your dime! Restaurant or movie gift cards can be the perfect way to let your loved one experience a fun dinner and movie experience without spending their own money to do so. Figure out what their favorite wine or alcohol is, and gift them with a bottle of it to enjoy. If they don’t drink alcohol, perhaps you could give them some hot cocoa mix instead! Gifting someone with goodies like bubble bath or bath bombs is a great way to encourage them to pamper themselves a bit in the comfort of their own home. The holidays can be a stressful time of year, and giving someone a gift that reminds them to slow down a bit can really help to offset that stress. Having some quality coffee or tea to be able to make in the comfort of your own home is so enjoyable, especially on a cold winter’s night. The gift of a warm beverage can really brighten someone’s day! The gift of a good read is usually appreciated by almost anyone. Books don’t take up a significant amount of space to store, and provide a wealth of information right at your fingertips. Books like The Life Changing Magic of Tidying Up might be the perfect pick for a budding minimalist or someone who wants to get more organized as the New Year approached. Click here for more book ideas for the minimalist in your life! Don’t forget about the gamer in your life, if your partner loves playing computer games then you should consider getting them a UnrankedSmurfs account if that is something that they would be in to. If you’re looking for inspiration to simplify and savor the holiday season, be sure to check out my Savor the Holidays course! It’s a 21 day mini course that will help you slow down and soak up all the joy this holiday season has to offer, and makes a great clutter-free gift for friends or family too ? I would love to have you join us! Click here to learn more. I hope this list serves as the perfect inspiration for choosing what to give the minimalists in your life this Christmas, or even those people like myself who work hard to keep their homes clutter-free and appreciate gifts that are given with that in mind. Happy holidays everyone! 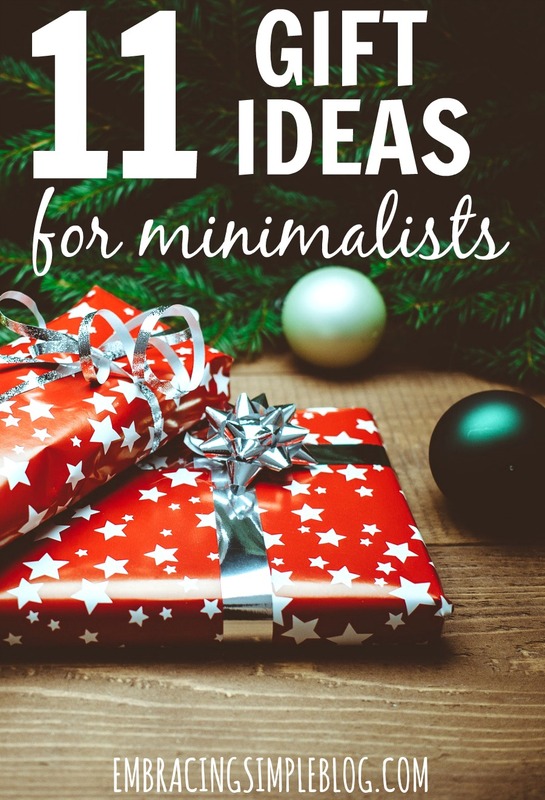 What are your favorite clutter-free gift ideas for aspiring minimalists? Great ideas! I think experiences are great gifts for anyone who doesn’t want any “things”. I’m planning on doing this with my kids by buying them memberships to museums and craft events. Thanks Sarah! I agree, experiences are at the top of my list. My brother got us a membership to the children’s museum for Christmas last year and we’ve LOVED going there! That sounds like so much fun Jeniece!! These are great ideas, Christina! My husband and I often choose to buy concert tickets (which can be expensive) for birthday gifts. I also totally agree with the high quality coffee, tea, and candles-so nice to get and you can enjoy them for months! Thank you Hannah! Aw that’s so awesome that you and your hubby do that, I love it! I love that Kimber, thanks for sharing your thoughtful post with us! Great gift ideas. As an aspiring minimalist, gifts can be so fraught – both giving and receiving.